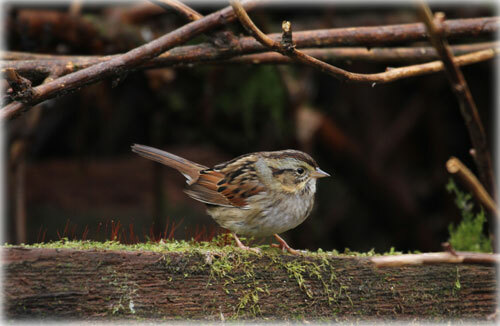 The Swamp Sparrow is a rare bird for this area, Ketchikan might get 0-2 sightings yearly. This Swamp Sparrow was seen in the Herring Cove area. Southeast Alaska: - Injured hiker rescued off mountainside - Keith Hutchins was safely rescued by an MH-60 Jayhawk and transfered to emergency medical service personnel in Juneau after he was hoisted off Ripinski Mountain near Haines Thursday. Coast Guardsmen present a safety brief to personnel from Juneau Mountain Rescue prior to departing the Army National Guard Hangar to help rescue Keith Hutchins who contacted Alaska State Troopers after he was injured while hiking above 1,600 feet on Ripinski Mountain near Haines Thursday, Jan. 6, 2011. Forty year old Hutchins reported by cell phone on Wednesday around 2 pm that he had been solo hiking on Mt. Ripinsky when he got disoriented on his descent and fell off a cliff into a steep ravine. He said the fall caused him to suffer severe pain, a back injury, and he could not move his legs. Hutchins was laying in snow beneath a tree and not visible from above. Hutchins was hiking above 1,600 feet on the mountain. The Alaska State Troopers, Alaska Wildlife Troopers, United States Coast Guard, Alaska Mountain Guides, Southeast Alaska Backcountry Adventures, Haines SAR Team, Skagway SAR Team, and Juneau Mountain Rescue responded to assist in the search. Hutchins' cellular phone allowed searchers to obtain his exact location on the face of a cliff which would require technical equipment and training to access. However, a weak phone battery complicated the communication with Hutchins. 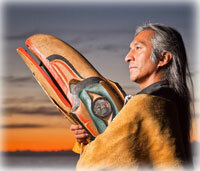 Southeast Alaska: SEARHC hosts Gene Tagaban ‘Art of Storytelling’ workshops - The SouthEast Alaska Regional Health Consortium (SEARHC) will host noted Tlingít performer and artist, Gene Tagaban, for workshops and performances in the “Art of Storytelling” in late-January in Hydaburg, Craig and Klawock. While on Prince of Wales Island, Tagaban will provide two free community performances - at 6 p.m. on Thursday, Jan. 27, at the Hydaburg School gym (before that night’s Yakutat at Hydaburg basketball games) and at 6 p.m. on Friday, Jan. 28, at the Klawock School gym. Tagaban also will visit schools in Hydaburg, Craig and Klawock to provide a series of workshops for local students about how to use stories to prevent suicide, prevent drug/alcohol abuse, add healthy foods to your diet, reduce screen time (TV, computer, video games, etc. ), promote physical activity, prevent bullying and other topics. DAVE KIFFER: Bringing The World To Ketchikan - The holidays always afford me that rare pleasure, ten or fifteen minutes to read something slightly longer than a text message. Well, recently National Geographic posited that the world population will top 7 billion later this year (2011). Beyond the fact that the population has more than doubled since I was born (a mere 3 billion folks were around to celebrate my birth in 1959), I was also struck by another factoid in the magazine. Someone at the magazine went to the trouble of “guestimating” how much space it would take to hold the entire earth’s population in one place if we were all standing together, elevator style (Otis Knows we would more than meet the maximium 2,500 pounds per car!). Turns out that for everyone to get that 3 square feet of space, it would take something like 750 square miles to hold all 7 billion people (including you and me and George W. Bush and Osama Bin Laden). Kinda surprising how little space is actually required for all those people. I’m gonna have to up my guestimates on the number of folks I’ve been crammed into subway cars with before. But to bring into a context we all can understand, there would be ten times as many people as could fit – comfortably or not – on Gravina Island. Or even five times as many people that could fit on Annette Island. But – and you knew where this was going – they would all fit (relatively) comfortably on Revillagigedo, and there would be another 300 miles to stretch their arms out a bit. Heck, if you decided to use all of the Ketchikan Gateway Borough (at 4,700 square miles, give or take). Everyone would have nearly enough space to lie down in (although not to roll over!). Revilla Road Problems By Ken Arriola - A couple of things; the front page photos submitted by locals are incredible, simply the best, one of the reasons I look forward to logging-on daily to Sitnews, much more interesting than that other publication, keep those photos coming. Articles & photographs that appear in SitNews may be protected by copyright and may not be reprinted or redistributed without written permission from and payment of required fees to the proper sources.